I did it! This has been on my list of things to do for so long, but honestly I’ve been very nervous to do it. 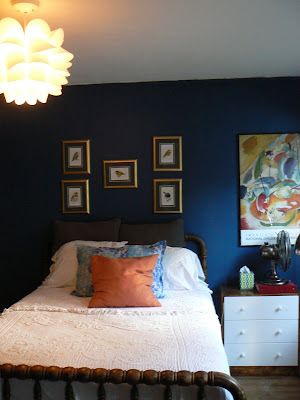 As I mentioned in this post, when I first moved in I had the three main light fixtures that came with the house changed (entry, dining, kitchen). The other big one that I wanted to change out was my bedroom. I had my cousin do the three lighting fixtures when I first moved in but I’m all about boundary pushing these days so I knew I wanted to do this one myself. The fixture that was in my bedroom was unobtrusive but that isn’t really my style. Six months ago I got the Knappa light from IKEA to hang in there, I assembled it and then left it hanging off a chair in the second bedroom this whole time. I told you I was nervous to do it on my own… but today I mustered all the courage I had plus a lot of internet research and youtube videos. I’m not going to lie, I did run into a few problems because the light fixture I chose didn’t come with a canopy (that round cap that connects the cord to the ceiling) and because my house is so old it was just all kinds of gross up there. But this post is in no way a ‘how-to’ it’s more of a ‘don’t follow my directions just be inspired that I did it and so can you’ post. Let’s skip all the boring sweaty parts and just skip to my favorite part, no it’s not the finished product, it was shutting off the power at the electrical box. Why was this my favorite part? Because I felt like Laura Dern in Jurassic Park… it was awesome! Remember the scene where she is going through that dark underground compound trying to find the power box? And then she flips all those big switches to save everyone from death by dinosaurs? It was kind of like that except no dinosaurs or dismembered arms. Alright enough of that, here is the second best part… the finished product! I’m so happy with the way it looks! I’m also super happy that I conquered my fear. Grade A stuff. I’m unnqtseiouably in your debt. Det bliver allerede sat ned d.27, sÃ¥ du kan mÃ¥ske stadig nÃ¥, at finde den perfekte kjole inden nytÃ¥r (til billige penge) Rigtig glÃ¦delig jul og godt nytÃ¥r til dig! I used latex gloves to place the photo on the tile and there are no smudges and I didn’t use a lot on the photo. Enough to last but not over abundance. Also, latex glove on one hand.Perfect!!! !